The Spreader is rugged enough to handle corn or soybean debris. for some earlier-model John Deere combines equipped with choppers, it allows their removal during corn harvest, saving fuel and wear on the chopper. The Spreader's simple, compact design offers easy access to the sieve area for routine adjustments or cleaning. Swing-away feature allows unit to swing out for easier access to the sieve area. The Spreader's dependable high-speed orbit motor runs in series with the reel motor, adding minimal strain to the hydraulic system. The high-efficiency design maintains sufficient spreader RPM even when the reel is slowed. for combines not equipped with hydraulic reels, other hydraulic hook-up methods are available. The unit mounts directly to the axle to assure a custom fit to your combine. Installation is quick and easy...just two to four hours for the spreader, hoses and other options. 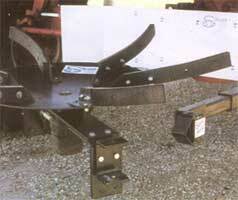 Call TODAY 800-428-9046 to order your Spreader.